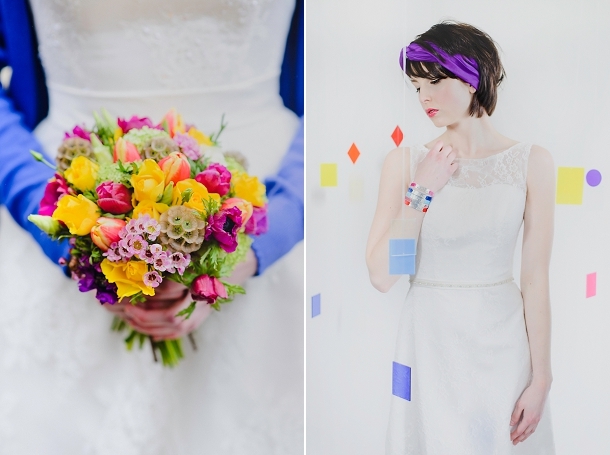 Prepare for your day to get a whole lot brighter, this contemporary styled shoot is full of bold colours and geometric shapes, and we love it! Styled by the lovely Elle from Inspire Hire, this shoot was a collaboration of the very best wedding suppliers in the West Country, all captured by photography duo Keith and Neda Riley. 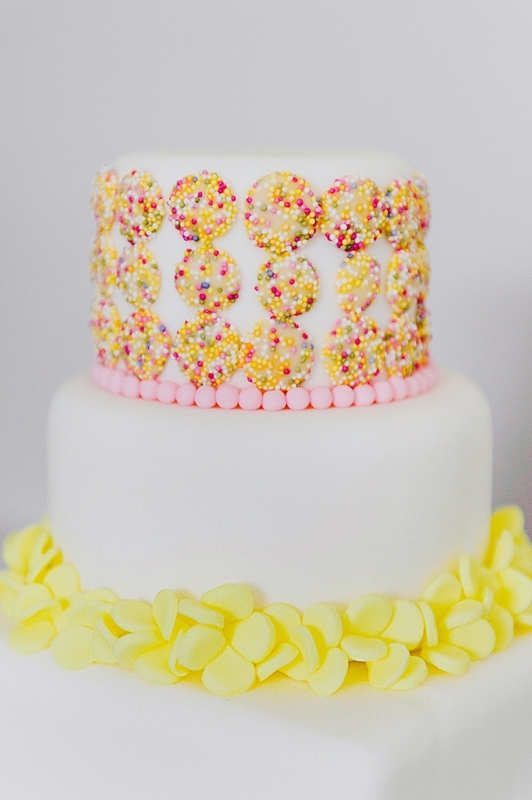 I love the way the colours pop against a crisp which backdrop, and coloured sprinkles adorn everything from LOVE letters to the favours. Even better, every idea is easily do-able too! As a stylist based in the South West the things that I love, and the work of the fabulous suppliers in the West Country, constantly inspire me. 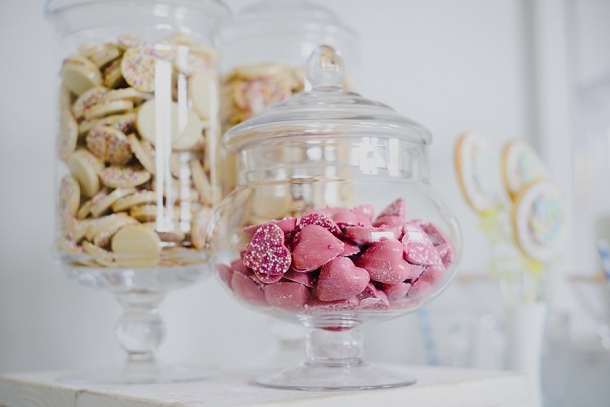 This ‘Sprinkles’ shoot combines my love contemporary wedding styling and my sweet tooth all topped off with a sprinkling of beautiful products from my talented fellow suppliers. 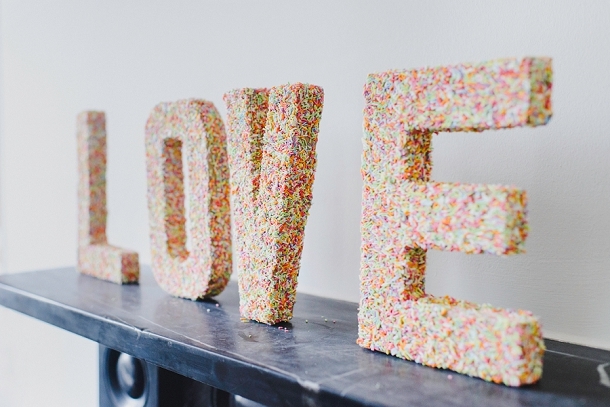 When I style an inspirational shoot I try to incorporate some fun DIY elements that are easy ‘makes’ for couples to recreate and use in their own decorative scheme. 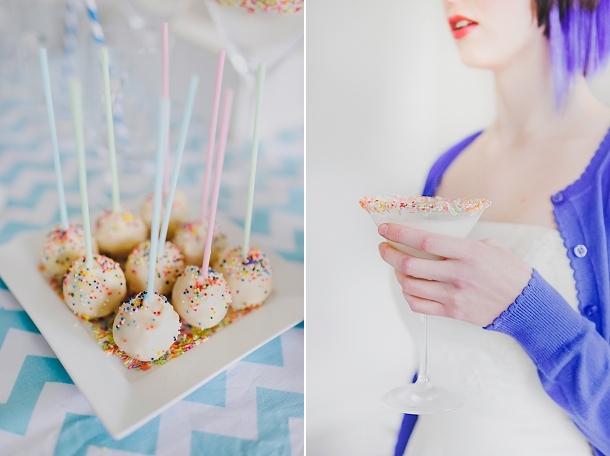 For this shoot I created some DIY sprinkles signage and some fun disposable ombre cutlery. 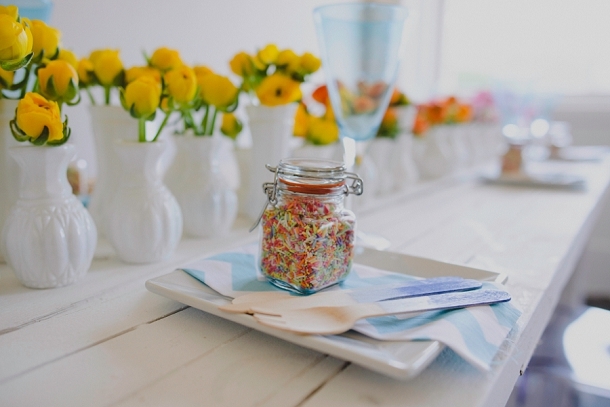 Our wedding favours are simple little jars of coloured sprinkles! My wedding couples frequently ask me to come up with alternative or unusual table décor. Often one of their worries with the more traditional decorations is guests being unable to see each other across the table. This is what led me to design this tablescape. 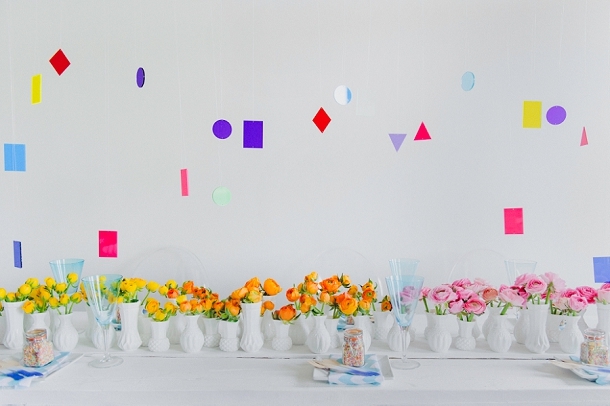 We used a low ombre floral arrangements from Emma Hewlett displayed in pretty white milk glass vases, set off by a bespoke geometric celling installation, which hangs above the table. This creates impact without obscuring the guests view. 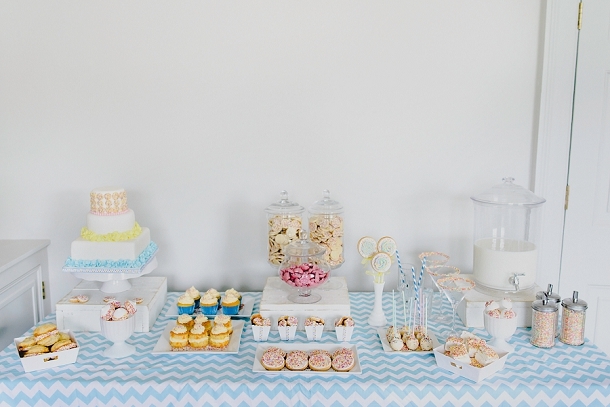 I worked with Nicola from Pink Elephant Cakes to create a fun and quirky dessert table. What could be nicer about a milkshake cocktail accompanied by sprinkles topped marshmallows and whoopee pies! I’m a huge fan of using something other than a standard white linen tablecloth and napkins so for this shoot we used our whitewashed tables dressed with funky chevron napkins, and of course our fabulous Ghost chairs. 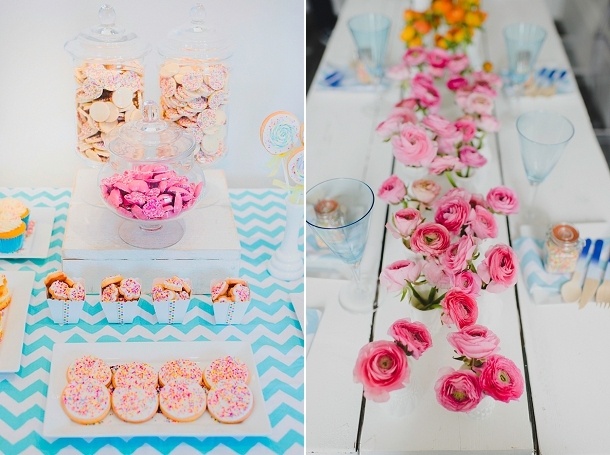 The aqua coloured glassware adds an extra pop of colour. 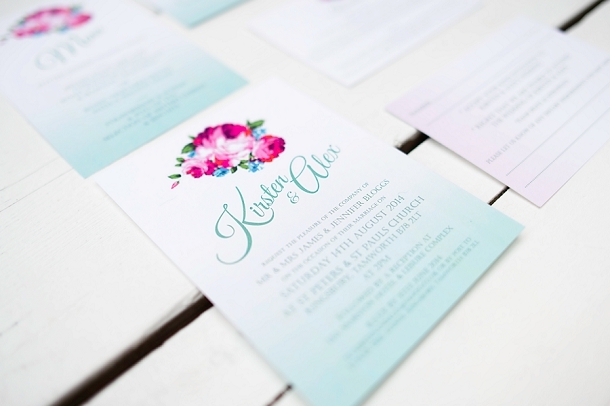 The ombre stationery range from Knots & Kisses suits our colour palette perfectly bringing in the aqua, cerise, orange and pinks. We teamed the beautiful understated dresses from The Wedding Company with simple high street store cardigans and shoes to bring a sprinkle of colour to the bride’s outfit. The Pop Up Salon created a modern look for our model Debbie, using some coloured hair extension to enhance her lovely locks, and her colour- pop make up! 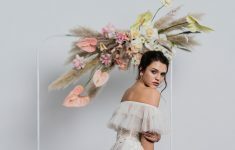 Holly Young creates beautiful headwear for clients all over the world from her workshop in Cornwall. 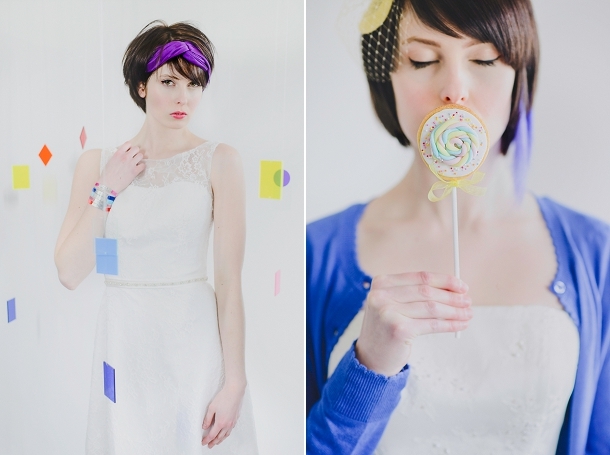 With a colour pop piece for every occasion we were spoiled for choice for amazing apparel for this shoot! 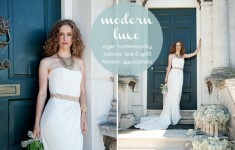 Our bride wears some contemporary wedding jewellery designed and made by Cornish company Syrup and Salt. 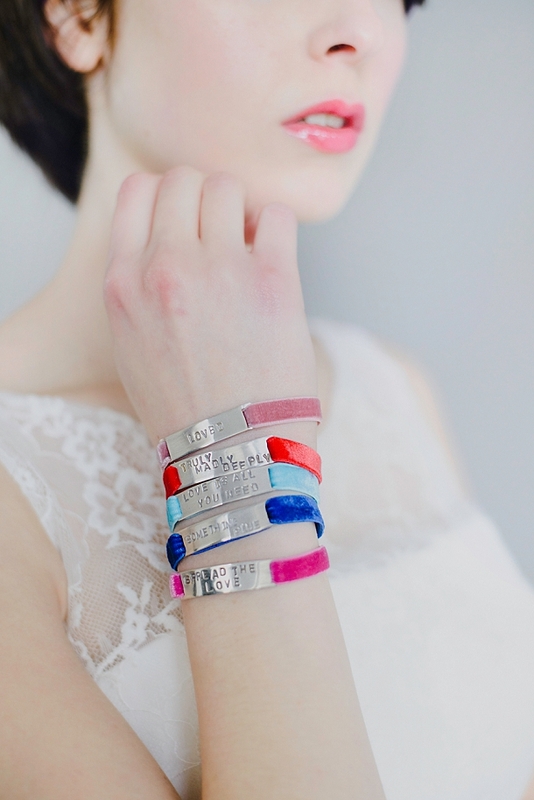 Syrup and Salt can personalize any word or phrase onto a bracelet. 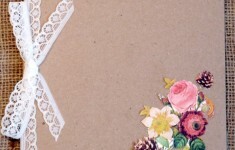 Perfect for a meaningful bridal statement piece or even a lovely bridesmaids gift. I hope that this shoot is as fun to look at as it was to create!